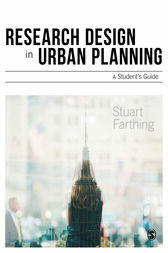 "This excellent book fills a significant gap in the literature supporting planning education by providing clear, succinct advice on the design and implementation of small-scale student research projects." "A perfect text for supervisors to give students so that they plan their research projects carefully rather than leap headlong into data collection." "Highly recommended... Ranging across topics such as planning a research programme and data management and the handling of ethical issues, the book will be very helpful to those embarking on a thesis or dissertation in the field." Packed with case studies, exercises, illustrations and summaries, Research Design in Urban Planning is an invaluable resource for students undertaking their first substantial, individual investigations. This excellent book fills a significant gap in the literature supporting planning education by providing clear, succinct advice on the design and implementation of small-scale student research projects. Although aimed primarily at planning students, the text is equally relevant to those undertaking similar tasks on other social science and built environment programmes.